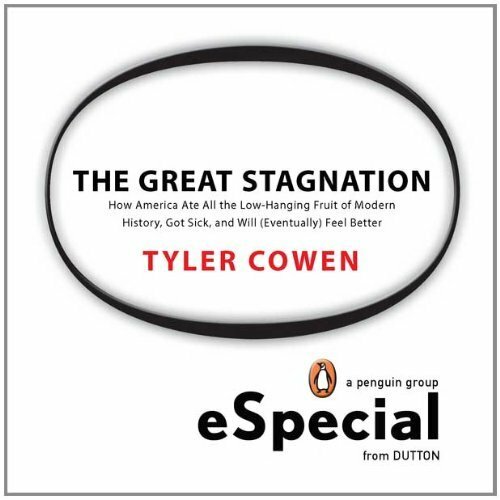 Tyler Cowen’s The Great Stagnation: How America Ate All The Low-Hanging Fruit of Modern History, Got Sick, and Will (Eventually) Feel Better is, at $4.00, cheap and packed with ideas that have been circling Marginal Revolution for some time. The mix includes the trajectory of history, the current economic crisis, technology, and economics. These might sound like disparate topics, but they come together, and Cowen summarizes the current economic crisis this way: “We thought we were richer than we were” (emphasis his). The book is an attempt to explain why we, collectively, operated under this delusion and what continuing to operate under it might entail. Note that The Great Stagnation is only available on the Kindle and is blessedly short: you won’t find the kind of padding that would be necessary to make a traditional, commercial book. I wonder if he will write one or two more of these booklettes (for lack of a better term—do we really want to call them “Kindle shorts” or something like that?) and eventually publish the collection through traditional channels as well. This description from Reihan Salam, pointed to by Cowen, is a good one: “I’m wary of summarizing [The Great Stagnation] — I really want you to read it for yourself — but the basic idea is very straightforward: Americans have grown accustomed to painless, automatic increases in prosperity.” I think this main point leaves out the idea of technological innovation as something underlying the fact that “Americans have grown accustomed to painless, automatic increases in prosperity,” but the point is good enough to observe. Nonetheless, one unstated idea in The Great Stagnation is that by learning about the idea of stagnating industrial economies, we might learn how to get out of them. Cowen has one answer, which is to raise the social status of scientists (this is always a good idea but seems improbable to me: admiring athletes and celebrities seems like a nearly universe behavior). Once alerted to this large-scale danger, we might be able to take small-scale steps to get out of it. One might be to combine Cowen’s description of slowing technological change, which he explains thoroughly, to Steven Berlin Johnson’s Where Good Ideas Come From. Johnson says good ideas often spring from the “adjacent possible” and that the idea of pure, lone genius may in some ways be overwrought. Notice the important weasel words in that sentence: Johnson is not opposed to the idea of genius, but it is not his chief concern. If we’re going to get more people together in the dense clusters that might lead to the major innovative breakthroughs necessary to power the economy, the solution might be to find a system or systems to implement some of Johnson’s major ideas. Universities already do a reasonably good job of this, but there may be other ways. For example, I imagine that Johnson would favor the idea of cities without major height restrictions, which would allow more people to interact and exchange ideas while spending less commuting time. I don’t think it a coincidence that Salam also thinks about transportation issues; he says “Commuting and congestion should be taken much more seriously then they are at present. Long commutes are a big source of misery for individuals and families” but mentions telecommuting as a possible solution. For many kinds of jobs I think that impractical; larger cities more amenable to families (through, for example, 50 story buildings with four bedrooms in each unit) might be a better option. If gas prices get high enough, this may become necessary, and it will have the side benefit of possibly increasing the number of Johnson’s adjacent possibles. Cowen touches on how World War II may influence current American expectations. America was protected during World War II, while Europe destroyed itself; memories of the destruction are much more alive on the continent, which may lower their expectations for material success. I would have liked more of a discussion on how World War II may have driven scientists, artists, and others to the United States and thus driven some of the applied prosperity from 1945 – 1973. Is that part of the “low-hanging fruit” that is much discussed? If so, how great a component is it? Other aspects of immigration policy may have helped the U.S. in that regard too. Did the Immigration and Nationality Act of 1965, which, according to Oliver Wang, “created preference categories for science, math and engineering-trained immigrants to come over” lead to a substantial advantage to the United States in technology? Incidentally, the act in turn favored Asians with strong math and science backgrounds, which may be part of the reason Asians are stereotyped with strong skills in those areas. One chapter deals with the Internet and how much it lessens the overall costs of fun while employing a relatively small number of people. Computers do an extraordinary job of leveraging the talents of a single highly skilled person; this is part of Paul Graham’s point in “How to Make Wealth” and “Inequality and Risk.” If politicians want to redistribute wealth because there won’t be as many spoils from growth, as Cowen as they are and will be tempted to do, they will largely be doing it from the kinds of people Graham is talking about. Graham is also unusual because he is putting his money and mouth where his time is through the creation of Y Combinator, a startup incubator / funder premised around the idea that a small number of people can have a disproportionately lucrative or effective tech business. So far Graham appears to be right. The very lean startups he funds probably employ relatively few people compared to large, existing companies, and they also provide the kinds of “cheap fun” Cowen writes about. If they’re not employing relatively unskilled people, who will? Possibly no one, except perhaps the Federal government; hence the zero marginal product ideas that have been discussed by Cowen and others. But if the cost of fun is cheaper, from the perspective of an individual we might be frustrated, but not as worse off as we might otherwise be. Although Cowen doesn’t say this, the whole world might be moving toward a university model, where the people who are having ideas (professors) do not capture very much of the economic benefit of those ideas. The people who have lots of Facebook friends or who get many people to watch YouTube videos derive little income from those activities but still like to do them. Professors obviously derive some income, but most people with the tenacity and intelligence (in that order) to get through a PhD program and become a tenure-track or tenured professor could probably earn more elsewhere. But if this kind of thinking and these kinds of life choices—trading income for prestige and raw knowledge—become more pronounced throughout the economy, it may lead to lower tax revenues and make people who like traditional kinds of consumption (cars, houses, vacations) less happy than they would otherwise be. There would be less money to pay off special interest groups. People who like writing blog posts to the point of doing so for no effective payment, like your correspondent, are probably better off thanks to the Internet, which Cowen identifies as the major technological innovation of the last 30 years. So using the Internet may take the place of other kinds of (expensive) consumption. Still, how satisfying is the Internet “fun” compared to other kinds? I would guess more satisfying than TV but perhaps not as satisfying as other kinds, which books like Hamlet’s Blackberry or Nicholas Carr’s The Shallows discuss. Does checking Facebook or e-mail 20 times a day make most of us better off, or do we have some kind of quasi-information addiction going on that leaves us hollow, like a conventional addiction of the coke / alcohol kind? I lean towards the Cowen large net benefit view but think the Hamlet’s Blackberry and “Disconnecting Distraction” view merit attention. Given that bubbles have popped in just about every asset market, and in many different countries, we can only understand the financial crisis by looking at some pretty fundamental and pretty general factors. It’s not about a single set of bad decisions or a single group of evil or misguided people It’s not Republicans or Democrats or farmers or bankers or old people or young people or stupid people or Christians or Muslims. There are no boogeymen. There is (or was) a flawed system or set of system premised on false belief. Cowen explains some ways this happened and some ways we might react. The details of his ideas are too fine to continue discussing here. Overall, The Great Stagnation does an impressive job of thinking at the margin, which very few people do, and in this respects may expand what we know and how we should think about the direction of the world. Still, it is hard for me to see it changing the overall shape of the debate in the U.S. There may not be an efficient way for individuals or small groups to change the debate, much as it is hard for a random person on their own to affect global climate change. I still wonder how a particular individual should respond to The Great Stagnation, beyond working to raise the relative status of scientists and perhaps lowering the status of athletes and celebrities, approving of school reform efforts, and recognizing that high rates of growth may not return in the immediate future. If you’re trying to maximize income, you may want to think about learning more math and programming, since many jobs in growth fields now require them (I majored in English and am in English grad school but think I’ve picked up enough technical acumen to be slightly more dangerous than others in my field). You should also know that The Great Stagnation is non-technical and easy to read. Density of ideas in this case does not lead to impenetrable or overwrought prose. A personal note: I’m pretty sure this is the first time I have reviewed a “book” that exists only in electronic form as I would another book. This may be a harbinger of things to come. In addition, based on how many other people are writing about The Great Stagnation, I suspect the eBook has spread to the chattering classes.